Growing in Grace Podcast: 645. 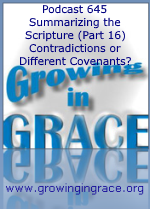 Summarizing the Scripture (Part 16): Contradictions or Different Covenants? 645. 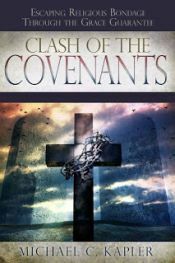 Summarizing the Scripture (Part 16): Contradictions or Different Covenants? Why did Jesus sometimes tell Jewish people to keep the commandments and obey the law? How do we reconcile that with writings from the Apostle Paul and others who revealed in Scripture that all people have been freed from that very same law? The contrast is clear, yet it is seldom addressed head-on by Church Incorporated. Religious tradition has adopted most of what Jesus taught as a new Christian teaching, when instead He was frequently ministering the law to people from Israel who were under that law. Gentiles were never under the law of commandments which came through Moses, and in fact, we find in New Testament writings where they (we) were never to be considered under that former ministry. Jesus delivered people from it, and brought them into a New Covenant (Himself), to live within a new life by the ministry of God’s Spirit.